OUR thermally-insulated ‘hot food’ bags proved a hit with visitors to our stand at the Restaurant & Takeaway Innovation Expo - where our message was ‘Keep It Hot’. The Restaurant & Takeaway Expo 2018 took place at the ExCeL arena, London, from September 25-26 – and it was Sirane’s first time exhibiting at the show. 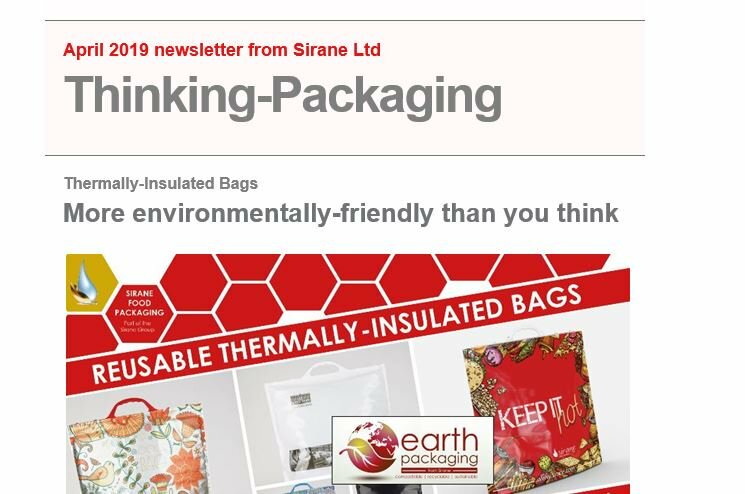 Sirane’s thermally-insulated materials keep chilled food cold – but perhaps crucially for this show’s market they also keep hot food hot – and we can offer bags in a range of sizes. Bags can also be digitally-printed, allowing for short runs without set-up costs. Simon Balderson, Sirane MD, said: “Keep It Hot was our theme for the show. Takeaways are as popular as ever, and customers want the food to still be hot by the time they get home. These bags are a great way of keeping them happy and making sure that happens. “We had a range of customers on the stand, from takeaway/restaurant owners to chains, all interested in the possibilities that these bags opened up for them. We’ll be adding a few standard products to our new web-shop (coming soon) meaning we can cater for all needs, whether you’re a single-site takeaway or a national chain. Simon also spoke in the lecture theatre on sustainable packaging solutions, which was well attended and well received. Simon gave an honest appraisal of the market – what’s possible and what’s impossible in food packaging terms, and how to quantify sustainability. Jeremy Haydn-Davies, sales director, said: “Our susceptor-based products allow food to be crisped up in a microwave, which is perfect for anyone wanting to add pizza slices, paninis etc. without having to keep warm – they can just heat them quickly as required. “We also offer a wide-range of steam-cooking bags, which may well have a place in both the restaurant and takeaway sectors, due to their flexible uses. We have nylon roasting bags which could be popular in restaurants, and this really is just a snap-shot.